Fathers: take your kids to school! 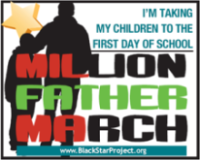 Be part of the national movement of fathers taking their children to school. Rob Ingram is asking local fathers of all backgrounds to take part. Oregon Public Broadcasting’s morning talk show Think out loud is covering school equity on the first day of school (Tuesday, September 8), with a focus on the PPS high school redesign. Guests include yours truly, Jefferson principal Cynthia Harris, and John Wilhelmi, who headed up the high school redesign effort for PPS. The show airs live 9-10 a.m. and is rebroadcast at 9 p.m. the same day. You can also listen online or download podcasts after the show has been broadcast.